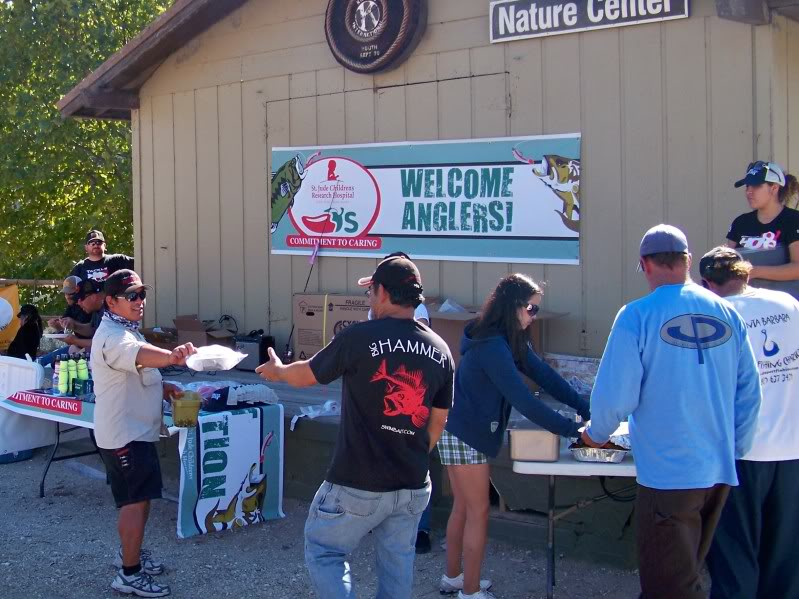 Chili's Restaurant St. Jude Children's Research Hospital Bass Tournament Lopez Lake 9/18/10. I have been very fortunate to have traveled to many fishing destinations. Many have been high level professional bass tournaments. I love these experiences, the exposure to learning from some of the best bass anglers on the planet and taking you to these venues. At these events success is measured in terms of how well an individual performs. I have been very fortunate to have traveled to many fishing destinations. Many have been high level professional bass tournaments. I love these experiences, the exposure to learning from some of the best bass anglers on the planet and taking you to these venues. At these events success is measured in terms of how well an individual performs. Recently I was even more fortunate to receive an invitation from Ben Florentino to participate in a bass tournament that represents something extremely special. At this event success was measured in how people performed collectively. Ben in conjunction with Chili's Restaurants have produced a very special day. Benefiting children's cancer research for the St. Jude Hospital this tournament represents what our beloved sport needs more of, anglers giving back to benefit a greater cause. I am moved to learn of the contribution that Chili's annually makes to this foundation. Each year on a particular day Chili's Restaurants donate 100 percent of the company's profits to this program. That is outstanding! Ben and the event staff should be commended for taking their personal time to do what so many will not. This represents what it means to be a part of something that is bigger than you. What a joy to see. I am going to present this piece with my "On Tour Signature", but when you see the photos of the guys holding the trophies know that their efforts are as worthy as any of the participants. Because the true winners are the kids at St. Jude. What a pleasure to have been here with everyone. It is comforting to know that when children are faced with similar health challenges there are people that care and are willing to do what it takes to give hope and make a difference. I hope you will continue to support Ben and Chili's and see that this program grows. 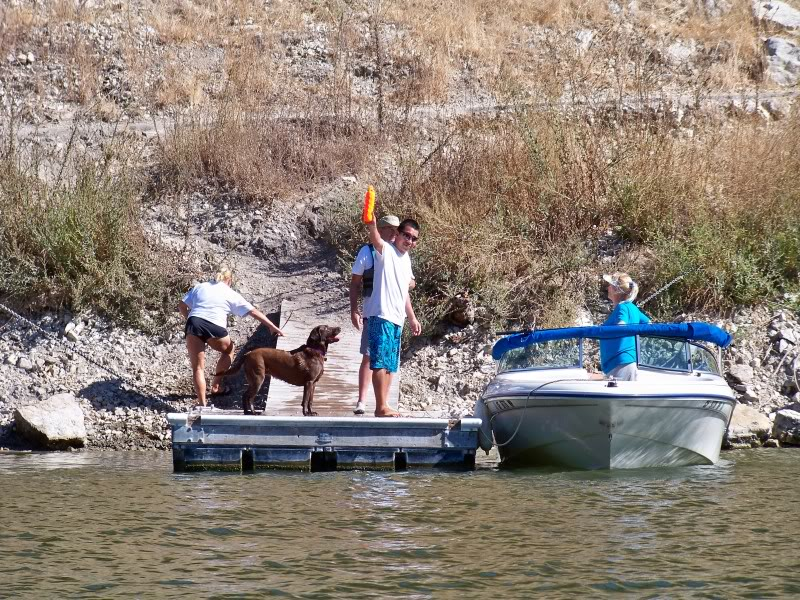 in the hills east of the city of Arroyo Grande is Lopez Lake. With excellent facilities that include a hot grill cafe and grocery mart there is a wide range of activities at Lopez. 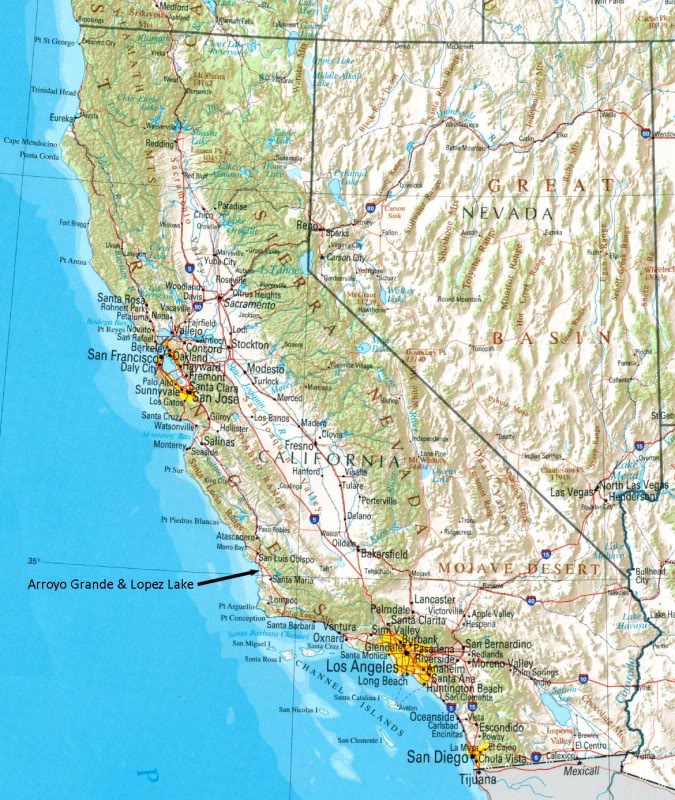 Lopez hosts several special events each year; the Lake Lopez Trout Derby, California Polytechnic University Triathlon and the Scott Tinley Adventures Triathlon to name just a few. This year another outstanding event has joined the list. 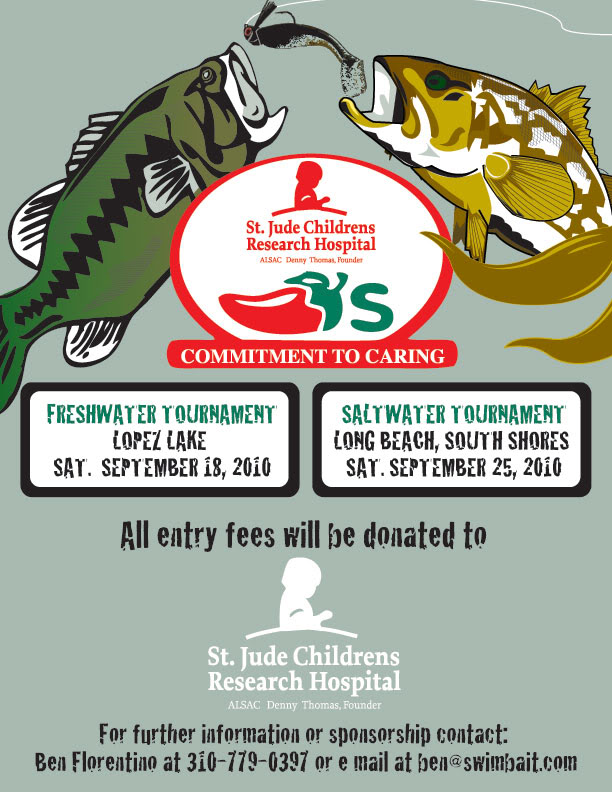 The Chile's Restaurant St. Jude Children's Research Hospital Bass Tournament. Benefitting children's cancer study this fund raising event is hosted by Tournament Director Ben Florentino. 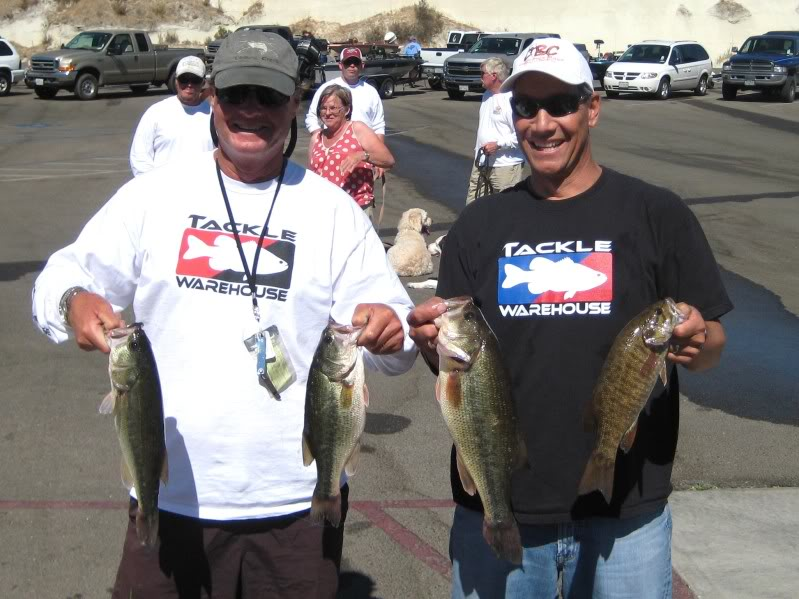 For the past five years Ben (left foreground handing prize) has produced this tournament at saltwater bass venues. This occasion marks the debut of the freshwater counterpart. Teams pay a $100.00 entry fee. 100% of the entry fees are donated to the hospital for children's cancer research. Ben has produced an impressive list of sponsors for this cause. Sponsors donate awards, prices, drink, food, and also pay for tournament costs. The sponsors gave generously and attendees were highly rewarded. The prizes and the raffle was one of the most impressive I have seen. Without sponsorship the tournament would not have been as successful. Take the time to review the sponsor list. Support the deserving, spend a few minutes of your busy life to let them know why they have your patronage. In these tough economic times a little extra effort will go a long way for all concerned. the teams started the competition under cool low morning clouds. As the day moved on so did the clouds giving way to a beautiful sunny day. while Master of Ceremonies Ben Florentino draws prizes. Wrapping up the day with trophy presentations. Top 3 teams with TD Ben, from left to right Danny Knotts and Felix Camacho-3rd place, Scott Garmin-1st place, Ben Florentino, Jeff Perry and Tony Voltaggio taking 2nd place. Thank you and congratulations to Ben and all the tournament staff. Job more than well done, your hard work really shows, well run, smooth and fun event. Congratulations to the big fish and the big bag winner Scott Garmin. Along the way to victory while out on the water Scott took the time to help fellow anglers who were struggling with a tough bite. Not only was Scott a class act on the water he also donated his option money winnings to St. Jude. Well done Scott! Congratulations to everyone who participated and supported this cause. You are all winners. Come out and be part of next year's program. A beautiful venue, camaraderie, good food and drink, tournament angling that really represents no-pressure fun fishing, lots of smiles and so much more awaits you.